Much like their counterparts of the past three years, home buyers in 2017 chose plans that provided plenty of living space, bedrooms, and bathrooms for their families. Definitely not McMansions, but 2017’s new single-family homes are designed with expansive living areas and outdoor spaces that address a family’s needs and comfort. According to the recently published study of the residential building industry by the U.S. Census Bureau – 2017 Characteristics of New Housing – the average size of a new home was 2,631 square feet. This is a mere nine square feet less than the 2016 average of 2,640 square feet, and 56 square feet less than 2015’s record-breaking 2,687 square feet. 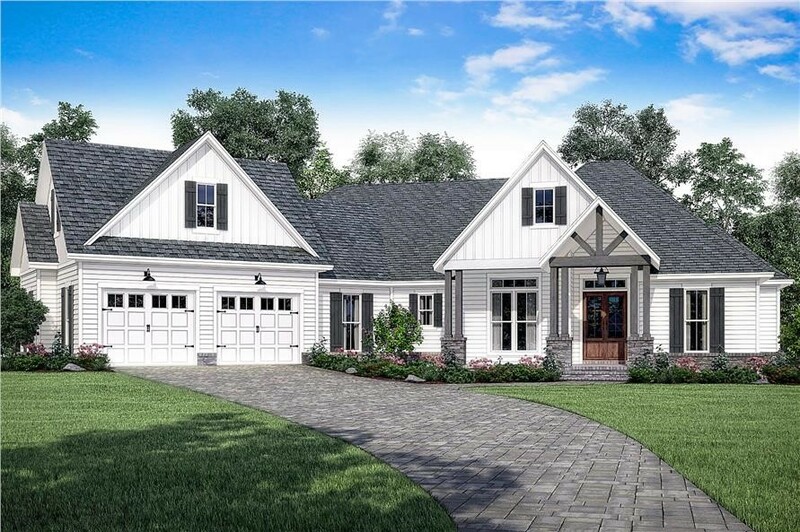 At 2,506 square feet of space, this 1-story 4-bedroom, 2.5-bath European style home is smaller than the average size of the new single-family home built in 2017 but has plenty of bedrooms and enough bathrooms to meet a family’s needs (House Plan #142-1162). Construction of new single-family homes has been on a steady climb since 2011. In 2017, the 795,000 new homes built topped 2016’s total of 738,000, and 2015’s 648,000. The Census Bureau also reported that the average price of a new single-family house sold last year was $384,900 compared with $360,900 in 2016. The median sales price of a new single-family home sold in 2017 was $323,100. 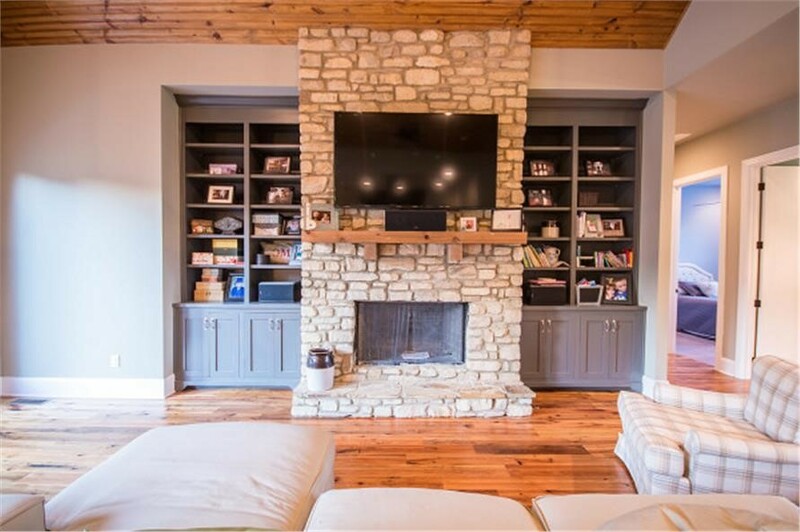 In 2017, the new single-family home – represented by this 4-bedroom, 3-bath Cottage-style home – had an average price sales price of $384,900. This home has an open floor plan, a finished basement, three fireplaces, a sundeck, and front and rear porches – features that are high on the list of potential home buyers (House Plan #198-1012). The square footage of the 2017 new single-family home may have decreased, but all the features and living space that ensure a family’s comfort are present in the homes. Of the 795,000 single-family homes completed in 2017, 742,000 had central air-conditioning (a whopping 93% of all homes); and 451,000 (57%) used forced hot air central heating. 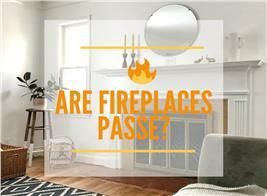 Fireplace: Homes with one fireplace numbered 320,000, or 40%. Only 38,000 had two or more – accounting for just 5% of new construction. The multiple fireplace number is down from a high of 84,000 in 2006. Stay cozy and warm in front of the fireplace in the Great Room of this 1-story, 3-bedroom, 2.5-bath Ranch style home with Craftsman influences (House Plan # 106-1281). 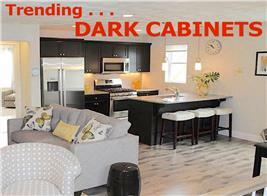 In addition to central air-conditioning and fireplaces, there were other interesting trends in newly constructed homes. Stories: Homes with two stories or more totaled 400,000, or 50% of the 795,000 built; one-story homes numbered 353,000 (44%). Bedrooms: Bedrooms and more bedrooms seem to be “must-haves” on potential buyers’ wish lists. In 2017, 362,000 (46%) new homes had four bedrooms or more. Homes with three or more bedrooms represented 44%, or 354,000 of the new homes built in 2017. About 10% (79,000) had two bedrooms or less. 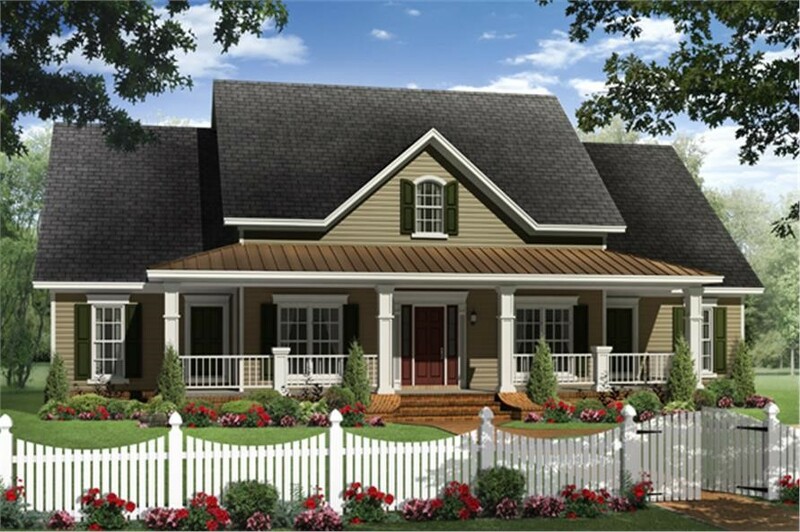 Top: This charming 1-story, 3-bedroom, 2.5-bath Craftsman plan includes an unfinished bonus space over the garage that can be converted into a fourth bedroom. 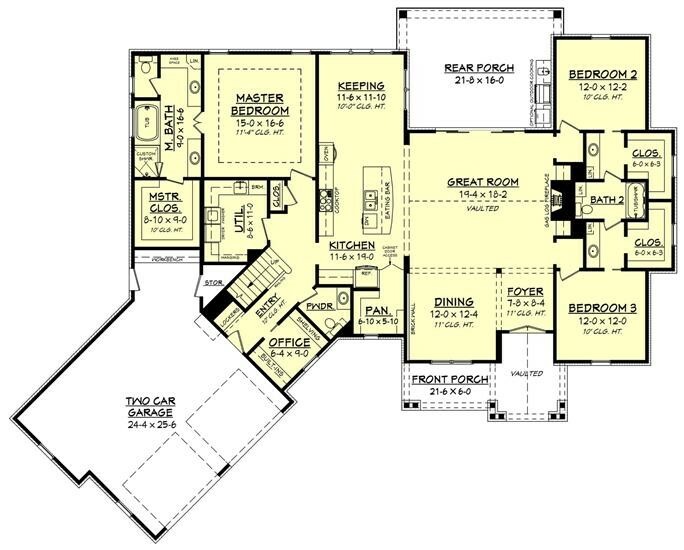 Bottom: The floor plan of the home shows how much useful space is available for a family of four, five, or more: a front and rear porch, foyer, split master suite, two bedrooms, Great Room, keeping room, pantry, office, and two-car garage (House Plan #142-1186). Baths: New homes with two baths numbered 243,000 (31%); a total of 227,000 (29%) had 2.5 baths; while homes with three or more baths accounted for 37%, or 296,000 of the total. What family can’t use an extra bathroom? This very modern bathroom with clean, minimalist lines is one of the 3 baths in a beautiful 3-bedroom Country home with Craftsman touches. 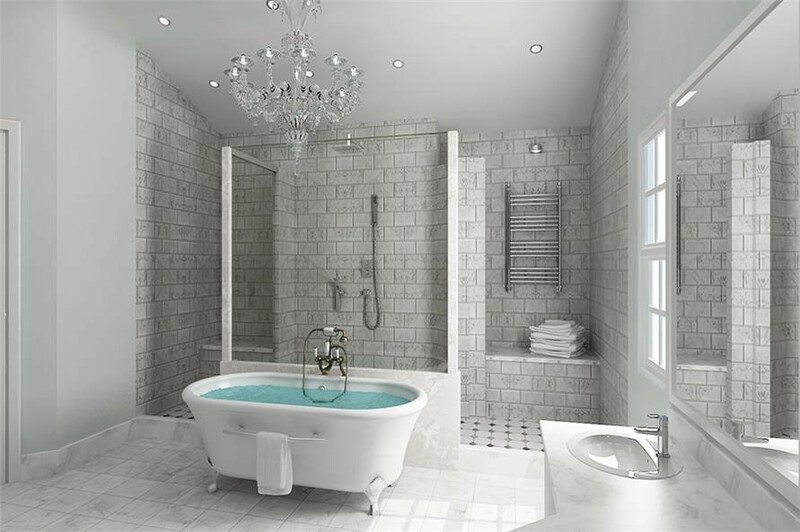 There is also a half-bath (House Plan #106-1283). Square Feet: The average floor area was 2,631 square feet, while the median square footage of a completed single-family home was 2,426 square feet. Garages: New single-family homes with a minimum of two garage bays totaled 517,000, or 65%, and those with 3 or more bays numbered 163,000, or 20%. There were homes with one garage (48,000) and a carport (10,000). The number of new homes without a garage or carport was 57,000. 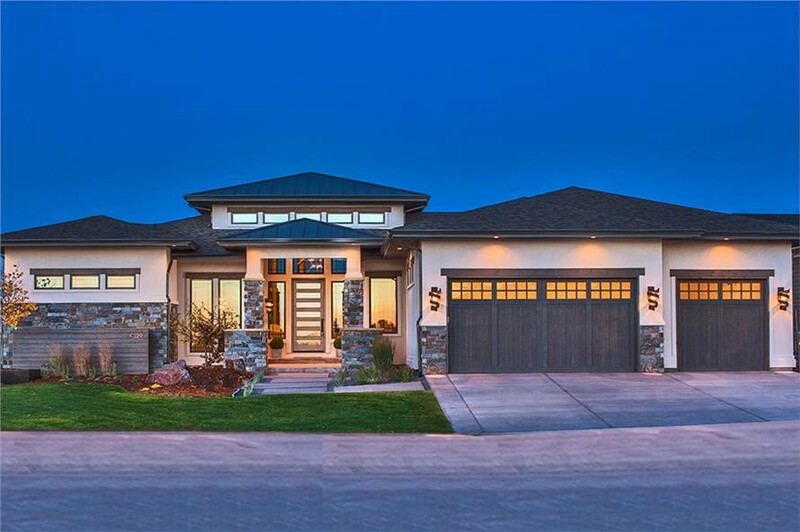 This attractive 1-story, 4-bedroom Contemporary Prairie style plan with modern touches includes 3 garage bays and a covered portico supported by a pair of stone columns (House Plan #161-1085). Foundation: In 2017, 204,000 (26%) of new houses built had a full or partial basement. Those on slab foundations totaled 475,000 (60%), and crawl spaces were used in 116,000 (15%) new builds during 2017. In the Northeast and Midwest, new homes with basements totaled 41,000 (70%), and 82,000 (68%) respectively. Slab foundations were more popular in the South – accounting for 333,000 (77%) of the 435,000 newly-built homes. The West also showed a bigger number of slab foundations: 98,000 (54%), but there were also new homes that featured full or partial basements: 46,000 (26%); and crawl space accounted for 36,000 (20%) homes. Siding: While vinyl remained the top choice for siding material at 27% (213,000), fiber cement is showing good numbers – up to 20% or 161,000 homes. Stucco was used in 24% (194,000) of homes; with brick as the primary external material in 22% (172,000) of new homes. Wood has definitely declined in popularity – with just 5% (39,000) of 2017 homes utilizing it for their exteriors. 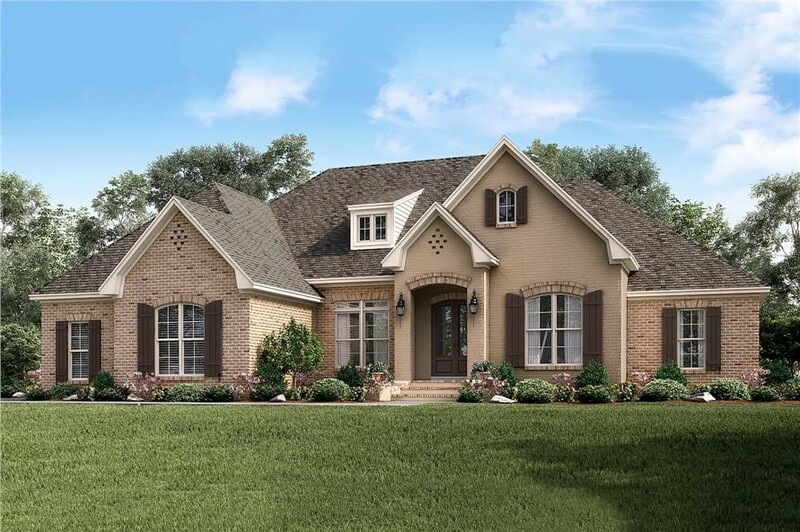 This lovely 4-bedroom Country style home with spectacular curb appeal uses brick, vinyl, and wood siding. Vinyl and stucco remain popular but there is an increase in the use of fiber cement as an exterior siding material (House Plan #141-1284). 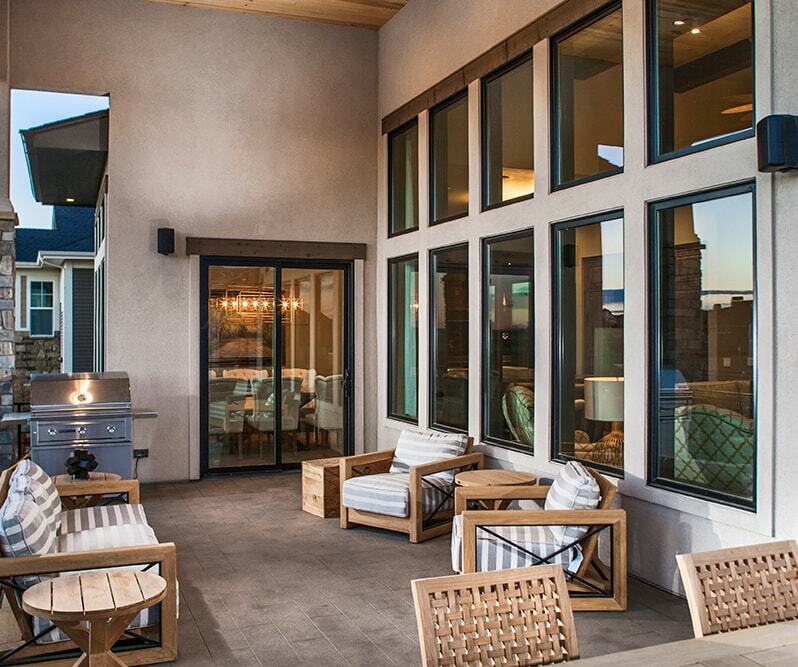 Outdoor Features: The study confirmed that outdoor living spaces continue to be hot trends – with 728,000 of the 795,000 new builds featuring a deck, patio, or porch. 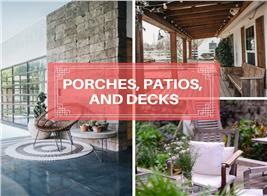 The most popular combination of patio and porch was found in 241,000 homes (30%); the deck and porch tandem was accounted for in 10% (83,000) of new homes. This very spacious and well-appointed deck in the 4-bedroom Contemporary style home shown above beautifully connects the indoors with the outdoors. Heating System Fuel: While 472,000 homes had a heating system powered by gas, there were 316,000 homes with electric power. Homeowners’ Association: Of the new homes built, 487,000, or 61%, belong to a homeowners’ association. 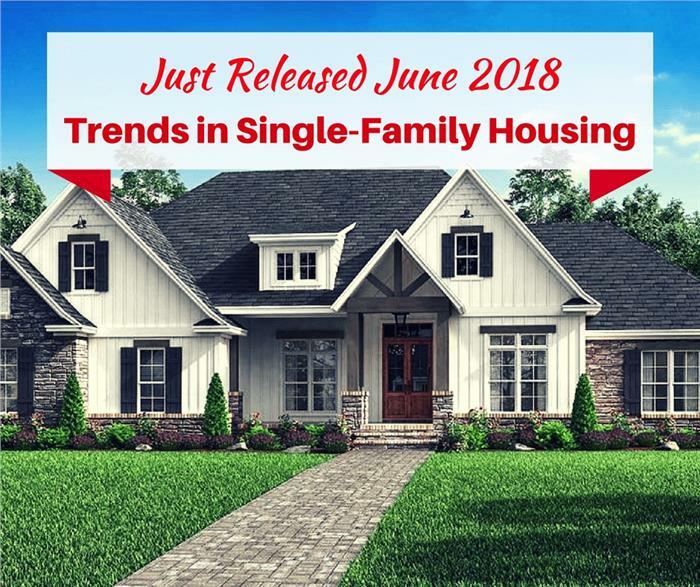 While new single-family homes built in 2017 decreased slightly in square footage, it is evident that Americans are still looking for bigger homes, not to impress but to focus on – and accommodate – family needs. With a renewed emphasis on family and comfort, there is reason to believe that potential home buyers are looking to live – and grow – in these homes for a long time. 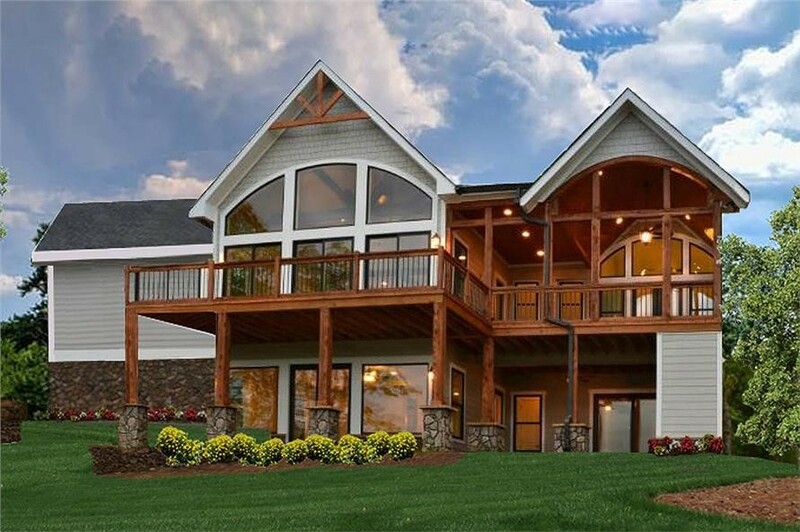 Footnote: The lead image in this article is an open plan 1-story Country style home with 4 bedrooms, 2.5 baths, a fireplace, and front and rear porches (House Plan #142-1189).